The energy transition plays a critical role in climate change mitigation, yet it is not occurring at a speed that effectively meets greenhouse gas reduction targets (IPCC, 2018). Policy makers are confronting the challenge to unlock flexibility and efficiency of energy systems. Among others, the European Commission (2016a, 2016b, 2017a, 2017b), the German Ministry of Economics and Energy BMWI (2017) and the former British Department of Energy and Climate Change DECC (2015) call for new business models (BMs) to overcome the inertia prevalent in the system. Business models are the value proposition of a company, i.e. the value creation and value capture strategy that a company pursues through the supply of goods or services (Niesten et al., 2016; Johnson et al., 2008; Magretta, 2002). Hence, they vary according to company’s target market, distribution channels, product or service offer, cost structure and revenue model (Osterwalder et al., 2005). Innovative business models can accelerate the systemic shift from the current carbon-intensive economy to a cleaner economy where flexibility and efficiency are enhanced (Johnson et al., 2009; Schleicher-Tappeser, 2012; Wainstein et al., 2016). They do so by better engaging with stakeholders for diffusion of new technologies and practices and by facilitating entry in established markets, simultaneously increasing the pressure on incumbents to take-up innovative measures as well. This section explores the barriers to the emergence of new BMs for low carbon products and services, as identified by the academic literature. The status quo represents a significant barrier to the experimentation of new BMs, as it poses both material and strategic constraints. The development of new BMs is often in conflict with existing BMs since any form of innovation would require the redefinition of the value creation process (Christensen, 2003; Charitou, 2012). Indeed, in order to capture value from new technologies, new BMs may involve new asset configurations, target new distribution channels and/or different end-customers (Christensen, 2003). Incumbents are therefore hesitant to invest in R&D and change their BMs as long as they are making profits with existing approaches (Gassmann et al., 2014). Utilities cannot apply their traditional profit formula to distributed energy resources (DERs), focusing on maximizing energy output in terms of cost/performance per kWh. The strategic value of DERs lies in the potential to supply different services through different business models (Richter, 2013b; Helms, 2016). The simultaneous exploitation of the different revenue streams DERs are able to capture (for example through the simultaneous offer of peak load response, frequency response, price arbitrage, commodity sale, price stability to consumers, brokerage services, asset sale, lend, rent, lease etc.) is more profitable than the maximization of their energy supply / storage capacity (according to the traditional economy of scales rationale). Energy consumers are generally indifferent about the sources of electricity they consume since it does not directly affect their consumption needs. Furthermore, payment for electricity is typically a passive action (Kim and Shcherbakova, 2011). Hence, incumbents are not encouraged to bring new technologies and/or BMs to the market (Richter, 2013a; Richter, 2013b) – the lack of demand constrains BM innovation. Nevertheless, on the other hand, new cleantechs such as DERs and smart meter companies have the potential to engage consumers – thereby, increasing demand-side participation. When BMs entail the installation of capital-intensive technologies, the capital intensity of the upfront investment typically represents one of the biggest barriers (Niesten et al., 2016; Engelken et al., 2016a). Furthermore, due to the long payback time of innovative projects, the profitability of innovative BMs tends to be low in the short term. On the contrary, traditional BMs have shorter payback periods. Owing to this, and given the existing financial products, innovative BMs have relatively lower capability to attract financing. Therefore, companies and cities struggle to create 'bankable' climate projects that attract debt/equity capital. The deployment of cleantech products and/or services often depends on public financial support through feed-in-tariffs, tax credits and other similar capital cost and/or revenue payments. Such dependency on direct public support for the financial-viability of BMs gives rise to boom-and-burst cycles (examples include solar PVs in Italy, Spain, UK, Nevada and several other States) (Burger et al., 2017). New BMs are thus not perceived to be self-sustainable – which many consider to be crucial (Engelken et al., 2016a; Richter, 2013a). Such uncertainty constitutes a difficult-to-manage risk for long-term planning (Engelken et al., 2016a; Held et al., 2006) – eventually limiting the growth of companies (Aslani et al., 2013). Policies promoting the energy transition seize remarkable opportunities for reshaping existing BMs and designing innovative ones (Engelken et al. 2016a; Richter, 2013a). Nevertheless, the competition with incumbent companies and the lack of clarity about future market design have a counteracting effect. Often it is unclear which actor will take advantage of which opportunity and takeover which role. The diffused uncertainty on the definition and distribution of responsibilities and roles to the various categories of actors in the energy market represents a considerable barrier to the roll out of innovative BMs (Niesten et al., 2016; Siano, 2014). Coordination and cooperation among energy market stakeholders is important for the efficiency of the energy system, especially in the context of DERs. Aslani et al. (2013) identified inadequate coordination among various RE market players as the main barrier for innovative BMs, alongside budgetary limitations and lack of information on market demand and its potential developments. The uneven distribution of costs among stakeholders has been recognized as a large barrier to the development of the EV sector (Weiller et al., 2014). Similarly, exclusive access to the storage capacity of ESS is not attractive to consumers (Lombardi et al., 2017) – whereas storage-space sharing BMs make ESS both attractive and profitable. Hence, the uncertainty about the future market design and the absence of incentives to cooperate (vertically and horizontally) represent a source of inefficiency and a barrier to the diffusion of innovative BMs (Roemer et al., 2012). An additional barrier that merits consideration is the lack of information – specifically, the lack of information on the technological performance, scalability and future technology, market, and policy advances (O’Keeffe et al. 2016; Girotra et al. 2013; Aslani et al., 2013). In the specific case of small and medium firms, poor understanding of public support schemes and lack of access to the related information have been found by O’Keeffe et al. (2016) to be considerable engagement barriers, together with the inability to match the high initial costs with economies of scale. Thereby, lack of information compounds the risk deriving from the diffused uncertainty about market sustainability and policy makers’ commitment. The following options are discussed in the literature for policy makers to address the barriers identified above. 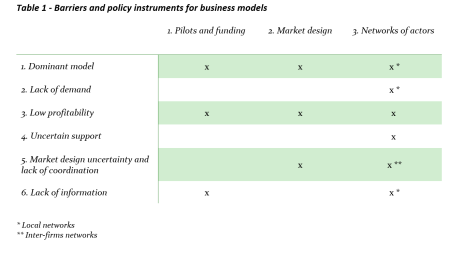 The primary barriers to innovative BMs are the dominance of existing models, the low profitability of the new models, and the resulting dependence on public financial support. Against this, the experimentation of innovative BMs, through pilots with different value propositions and revenue streams, would certainly foster the development and adoption of new BMs. Pilots have strategic importance since they allow firms to test different BMs and adopt the most profitable ones (Chesbrough, 2010). Niesten and Alkemade (2016) propose that policy makers grant funds for such pilots in order to enhance the full potential of DERs. Indeed, it is seldom discussed how DERs can capture the value offered. Usually the focus of pilots is one aspects of technical feasibility and systemic/consumers’ value creation. Nevertheless, to guarantee the economic-sustainability of the focal services, the profitability of the relative BMs shall be tested. This would enhance the development of commercially-viable BMs. While it is key to test BMs and shape the regulatory environment such that developments can then continue without dedicated subsidies, often public funding is essential to unlock those opportunities emerging through successful pilots. Niche markets need to be profitable within relatively short time horizons if greenhouse gas reduction targets are to be achieved. This is particularly the case of BMs that are not easily scalable because they are linked to regional customer base/skills (Iliev, 2005) and, therefore, have constant returns on early investments. The competition with incumbent companies, the presence of restrictive regulations and the lack of clarity about future market design prevent companies from adopting new BMs. This requires competition policy makers to secure market entry, and energy market regulators to consider the suitability for small new entrants for example of power market design. Overall, regulation plays a central role in the identification of DERs products and services that can be supplied. The value of DERs lies in the simultaneous exploitation of different value propositions. Hence, defining the type of products that can be offered, the market design and its participation rules, is key to enable the development of innovative BMs. This can substantially decrease the regulatory risk of innovative BMs and, in turn, the relative cost of capital. From a broader market-design perspective, in order to create more opportunities for low-carbon innovative BMs, systemic long-term considerations shall be fostered. This can be achieved through the adoption of Life-cycle Labels that tag BMs and investments according to their environmental sustainability. As a result, the risks associated with uncertainty and the long payback periods of such BMs would decrease. Furthermore, the incentives for the relevant stakeholders would alienate. Eventually, a larger number of innovative BMs would become economically-viable and new financing models may be developed to match the needs of the new BMs. Networks are a powerful instrument to align the incentives of different actors and stimulate actors’ coordination and cooperation. They can generally exist between firms, so-called inter-firm networks, and between different kinds of institutions, called regional networks (Sprenger, 2001). Inter-firm networks connect businesses to each other – allowing them to interact, exchange information, cooperate and share objectives (Sprenger, 2001). They can favor the understanding of regulations, policy environment, and the engagement of businesses with the policies. Furthermore, they may ease cooperation among firms and trigger the development of cooperative BMs, opening the field for revenue- and cost- sharing (Roemer et al., 2012). The interaction within networks has been identified as beneficial especially to SMEs, for the development of partnerships and innovative business models (O’Keeffe et al., 2016) and as a source of value, improving the internal rate of return of projects (Zhang et al., 2017). Similarly to inter-firm networks, regional networks can enhance communication, and often cooperation, between different actors along the value chain, not only businesses, but also research institutions, trade associations, public agencies, civil society and other groups (Sprenger, 2001). Regional actors bring diverse perspectives and inputs into network discussions, inspiring partnerships on different dimensions (Sprenger, 2001; Narayanan et al., 2004) and, eventually, BM innovation. For instance, cooperation between the energy industry and the financial sector can lead to new financing formulas for low-carbon BMs that meet the longer payback periods of the underlying technologies, as well as bring attractive returns to financiers. Innovative financing structures can open up novel pools of funds and investment opportunities. In order to facilitate such developments, platforms can be designed to bring together businesses and financiers for the joint design of financial solutions suitable to the needs of both demand and supply of financing (for an example see “Climate-KIC” in references). Zooming in on the community level, local networks can enhance the engagement of local consumers with low-carbon energy objectives of policy makers. They can trigger the development of a shared vision within the community (Van der Schoor and Scholtens, 2015). In turn, they can potentially galvanize the demand of DERs and innovative BMs in support to the energy transition. This would create priming conditions for more distributed and local deals, as well as for marketing local energy (Engelken et al., 2016b). Furthermore, it would be particularly beneficial to those BM innovations that are not easily scalable because linked to regional customer base/skills (Iliev, 2005). Supporting local networks can boost the paradigm shift from economies of scale (capital-intensive BMs, based on lowest-price value proposition) to DERs service and customer-tailored BMs. Thereby, local networks are likely to enhance the attractiveness of innovative BMs to financiers. Indeed, not only can they boost the demand for DERs, but also, in absence of an industry-leading position, customer-tailored service-driven BMs can be more appealing to financiers (Curtius, 2012). The connection of businesses through inter-firms networks, the communication among stakeholders through regional networks, and the engagement of local consumers through local networks are all triggers to potential coordinated change and BMs innovation. In light of this, policy makers should facilitate the development of such networks, promoting the use of information and communication technologies that simplify network engagement efforts. At the same time, they should regulate those networks, in order to ensure competition in the market (Midttun et al., 2017). A summary of the policy options proposed above and the relative barriers that they can tackle is presented in Table 1. Each instrument has the potential to resolve more than one barrier and to enhance BMs’ profitability. Hence, the combination of policy instruments can contribute to the development and adoption of innovative BMs. Business model innovation is vital for the energy transition, and yet difficult to implement. Typically, policy makers focus on the research of new technologies/products and their support through different forms of monetary incentives. However, various barriers to the adoption of new business models may also need to be addressed with alternative means. The literature review points to various policy instruments to address these barriers. There is a role both for funding (to catalyse development) and for defining an appropriate environment, such that developments can then persist without dedicated subsidies. The combination of funding and enabling regulation can allow innovative business models to materialize and diffuse. Aslani A, Mohaghar A. (2013). Business structure in renewable energy industry: key areas. Renewable and Sustainable Energy Review, 27, 569-75. BMWi (2017). SINTEG Ordinance. Entwurf einer Verordnung zur Schaffung eines rechtlichen Rahmens zur Sammlung von Erfahrungen im Förderprogramm „Schaufenster intelligente Energie – Digitale Agenda für die Energiewende“. Burger, S.P., & Luke, M. (2017). Business models for distributed energy resources: A review and empirical analysis. Energy Policy, 109, 230-248. Charitou, C.D., & Markides, C.C. (2012). Responses to disruptive strategic innovation. MIT Sloan Management Review, 54 C.
Chesbrough, H. (2010). Business Model Innovation: Opportunities and Barriers. Long Range Planning, 43, 354-363. Christensen, C.M., & Raynor, M.E. (2003). The Innovator's Solution: Creating and Sustaining Successful Growth. Harvard Business School Press. Climate-KIC (n.d.). City Finance Lab. Climate-KIC Success Stories. (accessed 4 March 2018). Curtius, H., Künzel. K., Loock, M., (2012). Generic customer segments and business models for smart grids: empirical evidence from across-European country study. International Journal Mark, 51, 63-74. Darby, S.J., McKenna, E. (2012). Social implications of residential demand response in cool temperate climates. Energy Policy, 49, pp. 759-769. DECC (2015). Community Energy Strategy – Creating the conditions for long-term growth. URN [15D/133]. Department of Energy and Climate Change. EC (2016a). Accelerating Clean Energy Innovation. Communication From The Commission To The European Parliament, The Council, The European Economic And Social Committee, The Committee Of The Regions, And The European Investment Bank. COM(2016) 763 final. EC (2016b). Clean Energy for All Europeans. Communication From The Commission To The European Parliament, The Council, The European Economic And Social Committee, The Committee Of The Regions, And The European Investment Bank. COM(2016) 860 final. EC (2017a). Third Energy Union Report. Communication From The Commission To The European Parliament, The Council, The European Economic And Social Committee, The Committee Of The Regions, And The European Investment Bank. COM(2017) 688 final. EC (2017b). Clean Mobility Package. Press Release Database. Engelken, Römer, B., Drescher M., Welpe, I.M., Picot, A. (2016a). 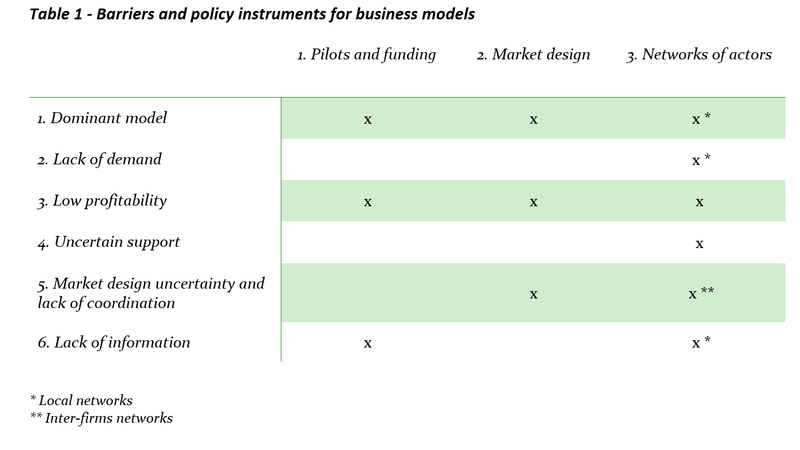 Comparing drivers, barriers and opportunities of business models for renewable energies: a review. Renewable and Sustainable Energy Reviews. 60, 795-809. Engelken, M., Römer, B., Drescher, M., & Welpe, I.M. (2016b). Transforming the energy system: Why municipalities strive for energy self-sufficiency. Energy Policy, 98, 365-377. Gassmann, O., Frankenberger, K., Csik, M. (2014). The St. Gallen Business Model Navigator, Working Paper University of St. Gallen. Girotra, K., & Netessine, S., (2013). Business Model Innovation for Sustainability. INSEAD – Faculty and Research Working Paper. 2013/77/TOM. Held, A., Haas, R., Ragwitz, M., 2006. On the success of policy strategies for the promotion of electricity from renewable energy sources in the EU, Report produced for DG TREN. Helms, T. (2016). Asset transformation and the challenges to servitize a utility business model. Energy Policy, 91, 98-112. Iliev, I. (2005). Resource-Based Technology Innovation in South Africa: Pre-paid Metering Technology – Systemic Innovation in the South African Energy Sector. Human Sciences Research Council. Employment Growth and Development Initiative – Employment Innovative Strategies. IPCC (2018). Global Warming of 1.5 °C- an IPCC special report on the impacts of global warming of 1.5 °C above pre-industrial levels and related global greenhouse gas emission pathways, in the context of strengthening the global response to the threat of climate change, sustainable development, and efforts to eradicate poverty. Johnson, M., Christensen, C., Kagermann, H. (2008), ‘Reinventing your Business Model’, Harvard Business Review 86(12): 50-59. Johnson, M., & Suskewicz, J., (2009). How to jump-start the clean-tech economy. Harvard Business Review 2009: 52–60. Karneyeva, Y., & Wüstenhagen, R. (2017). Solar feed-in tariffs in a post-grid parity world: The role of risk, investor diversity and business models. Energy Policy, 106, 445-456. Kim, JH, Shcherbakova, A, (2011). Common failures of demand response. Energy, 36 (2011), pp. 873-880. Lombardi, P. & Schwabe, F. (2017). Sharing economy as a new business model for energy storage systems. Applied Energy, 188, 485-496. Magretta, J. (2002). Why business models matter. Harvard Business Review 2002; 80, 86–92. Midttun, A., & Piccini, P.B. (2017). Facing the climate change and digital challenge: European energy industry from boom to crisis and transformation. Energy Policy, 108, 330-343. Narayanan, V.G., Raman, A. (2004). Aligning Incentives in Supply Chains. Harvard Business Review. Nov 2004. Niesten, E., & Alkemade, F. (2016). How is value created and captured in smart grids? A review of the literature and an analysis of pilot projects. Renewable and Sustainable Energy Reviews, 53, 629-638. O’Keeffe, J. M., Gilmour, D. & Simpson, E. (2016). A network approach to overcoming barriers to market engagement for SMEs in energy efficiency initiatives such as the Green Deal. Energy Policy, 97, 582 – 590. Osterwalder, A., Pigneur, Y., Tucci, C. (2005). Clarifying business models: origins, present and future of the concept. Communications of the Association for Information Systems, 15, 1–43. Richter, M. (2013a). German utilities and distributed PV: How to overcome barriers to business model innovation. Renewable Energy, 55, 456-466. Richter, M. (2013b). Business model innovation for sustainable energy: German utilities and renewable energy. Energy Policy, 62, 1226–37. Roemer, B., Reichhart, P., Kranz, J., Picot, A. (2012). The role of smart metering and decentralized electricity storage for smart grids: the importance of positive externalities. Energy Policy, 50, 486–95. Schleicher-Tappeser, Ruggero (2012). How renewables will change electricity markets in the next five years. Energy Policy, 48, 64-75. Siano, P. (2014). Demand response and smart grids – a survey. Renewable Sustainable Energy Review, 30, 461–78. Sprenger, R.U. (2001). Inter-firm Networks and Regional Networks. ADAPT. OECD. Van Der Schoor, T., & Scholtens, B. (2015). Power to the people: local community initiatives and the transition to sustainable energy. Renewable and Sustainable Energy Reviews, 43, 666-675. Wainstein M.E., & Bumpus, A.G. (2016). Business models as drivers of the low carbon power system transition: a multi-level perspective. Journal of Cleaner Production, 126, 572-585. Weiller, C., & Neely, A. (2014). Using electric vehicles for energy services: industry perspectives. Energy, 194–200. Zhang, C., Campana, P.E., Yang, J. & Yan, J. (2017). Economic performance of photovoltaic water pumping systems with business model innovation in China. Energy Conversion and Management, 133, 498-510.